What is travel and expense report software? 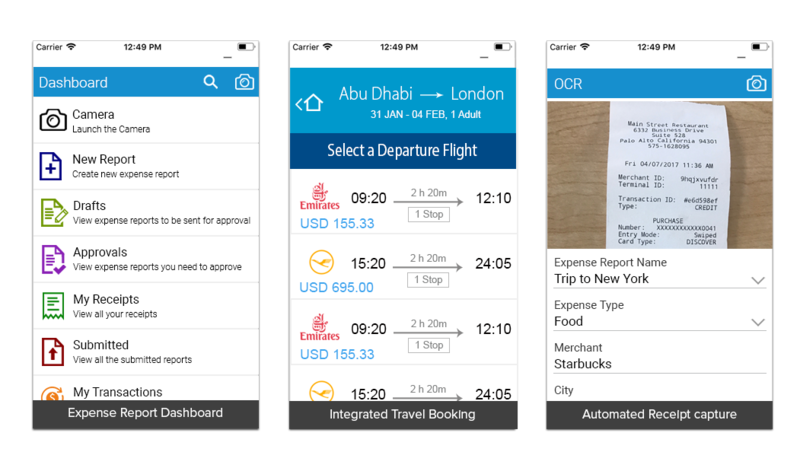 How does travel & expense report software work? Why do businesses choose cloud based expense report software? Who uses expense report software? What are the key challenges that drive business to seek out automated expense report software? What are the key features of travel and expense report software? How do I choose the right expense report software for my business? 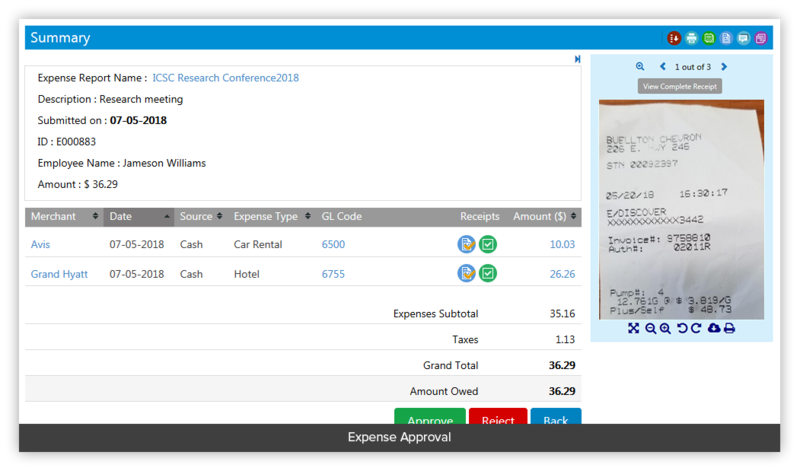 Travel and Expense report software (T&E Software) simplifies the expense reimbursement and reconciliation process by eliminating paper, reducing manual errors, and frees the user from the hassle of storing paper receipts. 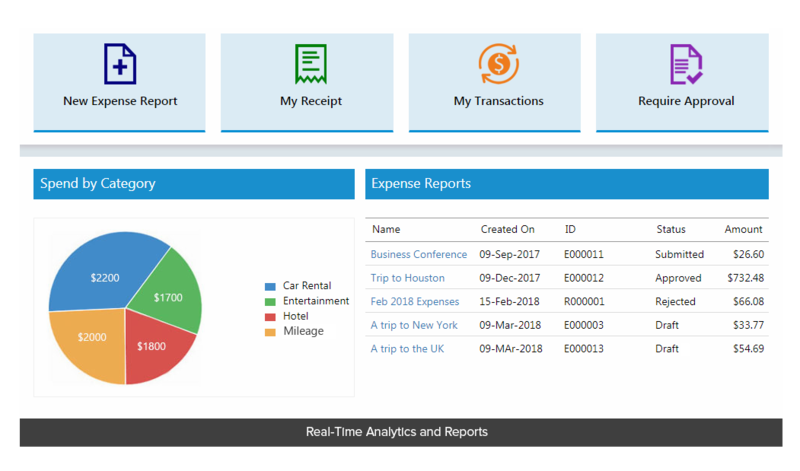 With travel and expense report software, you can automate the expense reporting process by pulling trip details into expense software, allowing users to capture receipts from smartphone, define limits & spend policies, and adopt existing, company wide expense practices within the software. Integration with travel software helps you gain invaluable insights into employee travel plans and enables you to easily figure out where employees are spending more in corporate travel. The solution allows you to gain visibility into employee spend while giving you complete control over the process from point of purchase to reimbursement or reconciliation. Take a snap and create expense entries even on the go without having to keep receipts for longer periods. Quickly process the expense reports with multi-level approval workflows without having the expenses stuck at any point. Speed up reimbursement process by making payments by check, direct deposit or any other payment gateways. Understand the metrics by charting, sorting and pivoting the expense data to make data-driven decisions. Why should businesses choose cloud-based travel and expense report software? Capturing receipts, submitting expenses, approving reports and tracking spend is just a click away with an intuitive web based and mobile user interface. Capture receipts instantly using your smartphone and leverage Optical Character Recognition (OCR) to read receipt data and automatically generate expense line items. Create expense entries, track mileage, capture receipts or approve expenses on the go with mobile app – available for Android and Ios. Leverage direct credit card integration to allow credit card charges to automatically flow to the correct user’s profile. Business expense management solution should support a variety of credit cards from corporate to personal. Once approved, transactions submitted on expense reports flow directly into your accounting system. Incorporate existing internal policies and spend controls as a part of expense report software to ensure compliance with predefined policy. Restrict non-compliant expense submissions from moving forward, or allow users to enter a comment as to why they’ve done and what they’ve done. Set different expense policies for various branches, divisions, departments, users and designations. Looking for cloud expense reporting software? Who uses travel and expense report software? A business’ main focus is on growing, and not managing corporate or personal travel expenses. Online business expense tracker should understand this and offers features to help your business scale quickly. As your business continues to take off and you enter the mid-market, you have to find a way to more efficiently handle an increase in expense report submissions. Automating this process, from spend control to integration ensures continued growth for your business. Online expense report software gives you flexibility to continue to expand at your pace and sets you up for additional and substantive growth. Large organizations enjoy increased opportunities through sales travel and customer centric relationships. Online expense tracker can automate the expense report process from point of purchase to reimbursement, and help businesses continue to run their operations smoothly and enjoy additional growth. When employees book unnecessarily expensive hotels, flights, and cars, they increase travel costs. Having an expense system with spend control in place all but eliminates this practice. Policy enforcement leads to reduced overall operating costs. Having a system that allows you to monitor and control this spend reduces overspending and curbs paying for out-of-policy expenses. Employees might struggle to capture, enter, and submit their expense reports in a timely manner. This tends to delay corporate card reconciliation and out of pocket reimbursement. Expense management app helps reduce the pain experienced by employees by automating the capture, entry, and submission process of expense reporting. Not having granular insight into company-wide spend practices makes it difficult to understand who is spending more, where and why. CFO’s, controllers and other concerned parties find it difficult to monitor and track expenses in the real-time without an automated expense solution in place. Automated business expense tracker helps by providing a full suite of analytics and reporting modules, allowing you to identify spend trends, curb unnecessary spend, and save money. Working with spreadsheets results in user pain, and user error. Entering expenses by hand, approving by hand, and keying into an accounting system by hand is time consuming and wasteful. Manually processing expenses costs your company time and money. Therefore, businesses need best expense software to track expenses and eliminate the manual requirements across the entire process. An integrated travel and expense solution allows you and your employees to book and manage itineraries from a centralized platform. Your booking details are pulled into the business expense management solution automatically. Create your expense report by speaking to the app. Leverage intelligent voice-based technology so you don’t have to type anything. Define flexible and multi-level approval workflows to automatically route your expense reports to the right managers for approval. Expense management solution allows you to define workflows based on dollar amounts, roles, locations, projects and department heads. Comprehensive audit intelligence capabilities allow you to adapt pre-existing business rules for expense categories. This helps prevent unneeded spend, allows deeper insight into each employee and their practices, and helps prevent non-business related expenditures. Intuitive dashboards gives you detailed insights into employee spend through various customizable report formats that help you make informed decisions. Automated reporting capabilities allow you to send PDFs, excel, and other reports without even clicking. Integrating with both internal and external applications, like an ERP or active directory, enables you get data out of expense system automatically. No manual entry required. This saves the AP team time and money and reduces user error. How to choose the right expense management software for your business? 1. What challenges you want to solve? Defining too many expense policies restricts employees and may cause confusion. Allowing employees to quickly access relevant policies and information they need enables travelers make bookings complying with the corporate policies. Paper-based methods make the entire process messy and leave no insight into employee spending. Not complying with corporate travel policies in many cases results in maverick spending. Often, employees don’t remember corporate policies or limits and commit out-of-policy spending. You can control spending only when you can see it. Inefficient processes provide no real-time visibility into spending and you’ll have no idea who is spending what and why. The manual expense reporting process is cumbersome and requires approvers and accountants to verify and validate the data, resulting in significant reimbursement delays. How employees can submit expense reports? Can I easily find receipts? Is your expense reporting process taking too long? How do you approve expense reports? Is there a formal process? What improvements need to be made in your expense reporting process? Who uses the solution? Is it just a few employees or a particular department or the entire company? What other solutions do you need your expense solution to integrate with? How tech-savvy are your employees? How much training is required? Do you want the solution to be accessible on mobile devices? On-premise and SaaS solutions are two options available in the market today. For on-premise, you have hardware, installation and maintenance costs. The other way is to go with a SaaS solution that ensures your solution will always run on the latest version, without any installation. Cost Pay as you use model. No hardware and maintenance costs. Pay for hardware, software and licensing. Deployment Easy deployment. No installation required. Software updates can be pushed automatically. Deployment time is longer. Complex setup and IT support is required. Customization Solution can be easily customized using APIs. Difficult to customize. Integration SaaS solutions are built on open-platform architecture and can be easily integrated with other business applications. Limitations on the data volume and access; lot of administrative work. Hardware No hardware maintenance, everything is done by the solution provider. Need to install hardware and maintenance costs are high. Control Accessibility can be controlled by the provider but data is owned by customer. Since the solution is installed on the machine, customer can control the systems. CFOs are not the only decision makers; considering the opinion of all stakeholders such as travelers, finance department, and employees would help you choose the right software. You have to understand the process every stakeholder undergoes, and address their questions to eliminate the bottlenecks. Ask your employees how they are processing expense reports and what they’d like to improve. CFOs will need to understand where most employees are spending their money and what reporting the company is lacking. When taking a test drive, make sure at least one member of all user types are involved and gather their feedback on how a particular process can be improved. Consider choosing a solution that works best for all. Integration is one parameter that businesses should look for in cloud-based applications. The solution should seamlessly integrate with internal systems and other cloud services. When evaluating a solution, verify if it can integrate with internal and external applications. Evaluate how open the new solution is, what applications the solution can integrate with, and how long the integration will take. Assessing the criteria can help you easily sync data with multiple applications without much data transition. Security is the biggest concern for businesses switching to cloud-based applications. Check with the vendor to see how they are going to store your sensitive data? Evaluate the security measures by reviewing certifications, accreditations and standards of the company. 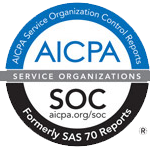 SOC2, ISO27001 and GDPR compliance are various security standards and choosing a vendor complying these standards ensures your data is stored securely. Switching to cloud solutions means all the setup, deployment and technical support will be managed by the service provider. When choosing a software vendor, make sure they follow the best practices to manage your project. The gradual development of the e-commerce market has led the retail industry to stay on its toes and keep up with the competition. There is absolutely no joy in delaying expense reporting where managers have to keep asking employees for reports continuously for the purpose of reimbursement.